Need LG WM2050CW Front Load washing machine Reviews & Ratings? Considered one of the best values in front loading washers, the LG WM2050W offers incredible options, capacity and performance for a list price of $649. User reviews are generally excellent with most users praising the LG WM2050W's consistent cleaning performance, many wash settings, high efficiency, good value and fast spin speeds. Users also commonly listed vibration and long cycle times (90 Minutes) as some of the LG WM2050's cons. The LG WM2050 is Energy Star estimated to use 160 kWh/yr, which is very efficient and will result in annual operating cost savings. The biggest compromise at this price point is the capacity. While adequate for most small families, the 4.0 Cubic Feet capacity may be too small for larger families. To put this into perspective, 4.0 Cu. Ft. should allow you to run 22.5lbs of laundry/wash. If you have a king sized comforters or large family, you may want to consider a minimum capacity of 4.0 Cu. Ft. Smaller capacity for most families may just mean an extra load here and there. Most consumer reports publications position the LG WM2050W washing machine as a STRONG RECOMMENDED BUY. #1) High Spin Speed: By achieving spin speeds of up to 1,100 RPM the LG WM2050W washer wrings out a lot of moisture before the end of the wash cycle. This generally results in lower dry times and less money spent during the high energy demanding dryer cycle. #2) Great Reviews: Great overall LG WM2050W reviews by both leading washing machine review publications and user reviews. Pro's commonly noted on efficiency and washing performance as well as overall value. Pros commonly outweigh Con's and most users recommend this washing machine. #3) Energy Efficient: This LG Washer is Energy Star rated and estimated to only use 160 kWh/yr, which is low by most standards. All this translates to cost savings, especially if you replacing a less efficient top loading washer with this front loading washing machine. #4) Great Cleaning: At the end of the day, the LG WM2050W ranks high on its ability to consistently clean clothes at a high level. Users frequently comment on this as one of the biggest pros. LG's SenseClean system automatically adjust water levels and wash times base on the loads size and weight. This technology, coupled with multiple wash cycles allows you to handle a variety of soil levels for consistent cleaning. #5) Configuration Options: The WM2050 is also stackable with its sister dryer, which makes it ideal for tight quarter installations. If you don't need to stack, you can also configure the washer and dryer side by side. #6) Great Design: You can always count on LG Washing Machines to go the extra step in making sure their products look good. Great design also can be found in the LG WM2050W's user interface which most people find very easy to use. The control panel offers both rotary dial and electronic buttons. Cycle operation is very quiet. 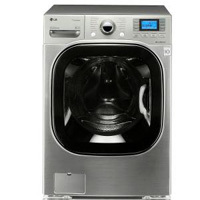 #7) Value: LG produces some of the most reliable washing machines on the market and this washer is no exception. At $699 list price you'll be hard pressed to find a washing machine with similar features, capacity and reliability. This is a solid buy and highly recommended. #1) Cycle Time: With a cycle time of 90 minutes, the LG WM2050 is not the fastest machine. This coupled with a 4.0 Cu. Ft. capacity, may mean more wash time for larger families. If you have a large family with heavy laundry requirement, spend the money for a larger washing machine. #2) Extra Steps: Some users have mentioned the need to wipe down the seal after each use and keep the door open to prevent growth of mildew. While most front load washers have this issue, it is still an extra step to be taken after the wash process. #3) Vibration: While a proper installation and padding are important some washing machines vibrate more than others. The LG WM2050W is best used for a first floor installation. In terms of overall value at the $699 list price point, you can't beat and LG, especially if it's the LG WM2050CW washing machine. If you have a large family with high weekly laundry requirements, you may want to seek larger machines. This washer is a solid performer without all the bells and whistle found on more expensive models. This washing machine is highly recommended and you can read more unbiased user reviews here. STRONG BUY RECOMMENDATION.